Even if you’re not a tech-head, it’s almost impossible to not have heard of the world’s most successful tech titans – Apple, Google and Facebook. But what do these big brands have in common? They’re all based in America. And while America is undeniably a technology powerhouse and the hub for some of tech’s most iconic names, there are advances happening in continents across the globe. Asian companies play a huge role in our ever-developing tech scene and are amongst the most innovative and valuable in the world. Home to leading electronic companies, Samsung and LG, South Korea has seen remarkable gains since its slump in the mid-late 1900s and now has the fastest internet in the world. What’s more, Japan has established itself as the land of the rising robots and is inventing at a rate which rivals China, despite a relatively low population of 127 million. According to Forrester, China’s tech market will grow by 8 percent in 2018, while Japan will boast a 5.1 percent growth. But where does Europe fit into the picture? 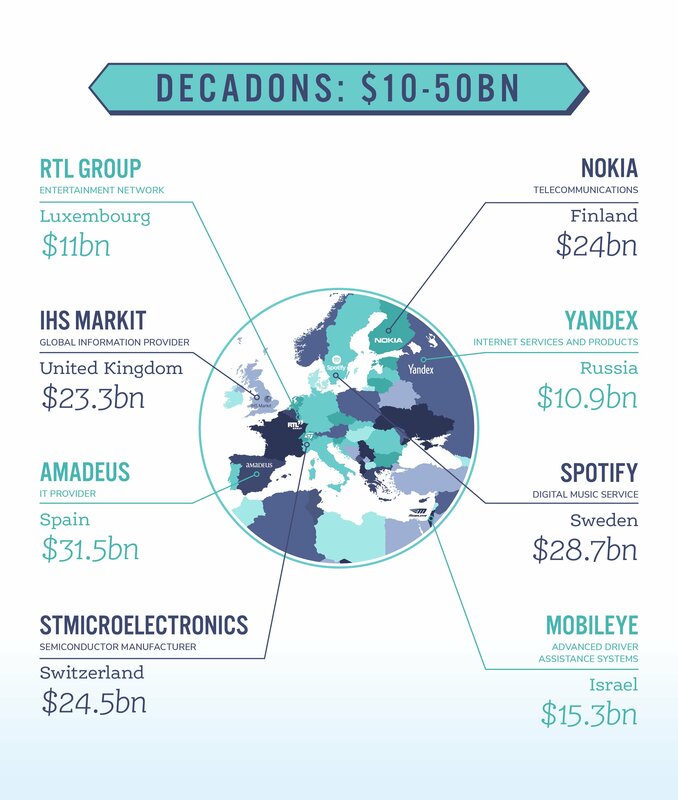 Despite America accounting for almost half of the world’s billion-dollar tech companies, Europe is emerging as a vibrant playing field for tech entrepreneurs and is making significant advances in IoT, Fintech and AI, to highlight a few. The below map infographic shows some of the continent’s household tech names as well as some lesser known companies. Each country has been labelled with one of its biggest tech companies, based on valuation, and each map has been categorised into groups - Titans ($50bn+), Decadons ($10-50bn), Unicorns ($1bn+) and Rising Stars (potential to reach $1bn). It is important to note that these rankings are not a representative of the country’s cumulative value. Companies were chosen based on their valuation, but are not necessarily the most valuable. At the top of our list we have SAP SE – a German software company that develops enterprise software for business operations and customer relations. Having recently opened its very own cloud data centre in the UAE, SAP’s move signifies Europe’s desire to follow the US with its growing appetite for the Middle Eastern market. Booking.com comes a close second with a staggering valuation of $99.1 billion. The travel fare aggregator website is a go-to for holiday hunters and has dominated the travel tech market alongside Spain’s Amadeus, UK’s Skyscanner and America’s Airbnb. As for Decadons, it’s the Nordic countries that are racing ahead. With companies such as Spotify, Nokia and Skype, Sweden and Finland have excelled in producing brands that demonstrate how to use technology as a means of communication and sharing information. Not only that, but Switzerland is home to STMicroelectronics - Europe’s largest semiconductor chip maker. Through combining science and technology expertise, the semiconductor industry is one of the most lucrative in the world and continues to experience significant growth, as shown by STMicroelectronics’ increase in revenue which is up 18 percent year-on-year. Other markets which continue to soar in this category include the automotive market, and providers of information, data and services. 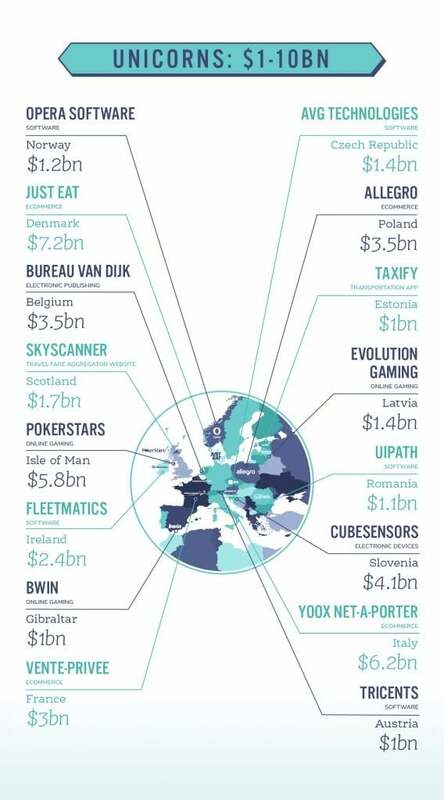 Europe has just shy of 50 tech unicorns, according to Business Insider. And while the UK may have the largest cumulative value of all European countries, Sweden, Germany, Israel and Russia (all of which are home to major Decadon companies) aren’t far behind. Interestingly, there are some resounding similarities across the board. 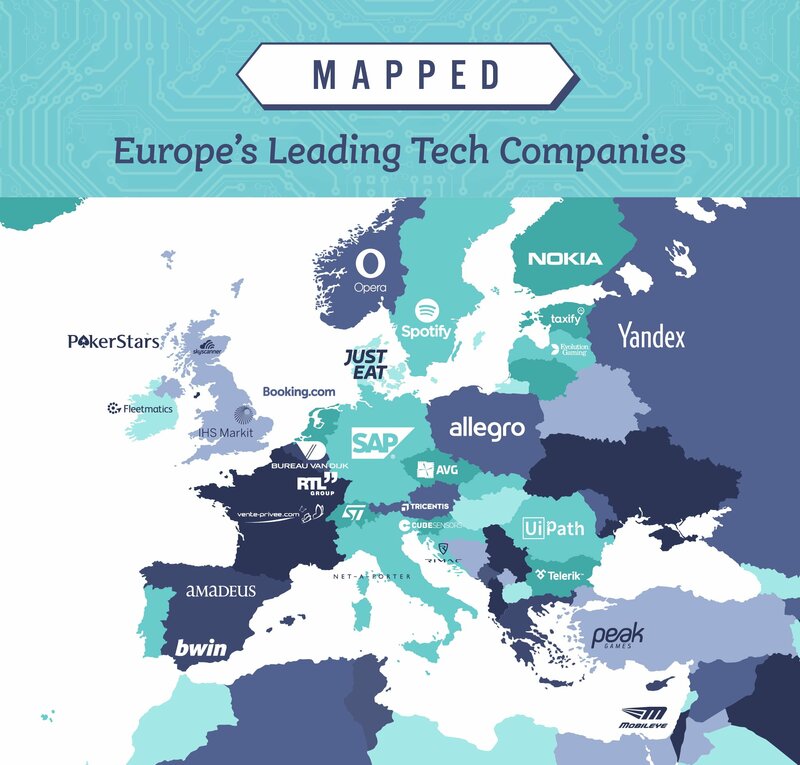 Our research found that Europe is commonly home to software unicorns – the most valuable on this list being Ireland’s Fleetmatics. Proving an incredibly competitive market, this industry sees countries from all over the world developing programmes at an incredibly rapid rate. The e-commerce industry also remains a strong player in the field thanks to the likes of Just Eat, Yoox, Net-A-Porter and Allegro. In 2017 alone, the total ecommerce turnover in Europe increased by 11 percent from the previous year, making it worth €534 billion. As for Europe’s online gaming market, PokerStars, Bwin and Evolution Gaming are all making their mark. According to Eilers & Krejcik Gaming, Spain, Denmark and Italy lead the way in terms of growth, but with the emergence of new markets such as the Czech Republic, the industry is set to expand its geographical reach. Last but by no means least, we wanted to wave the flag for some of the continent’s lesser-known companies. Despite their smaller valuations, these tech businesses are all being recognised for their pioneering developments and have a great deal of potential. 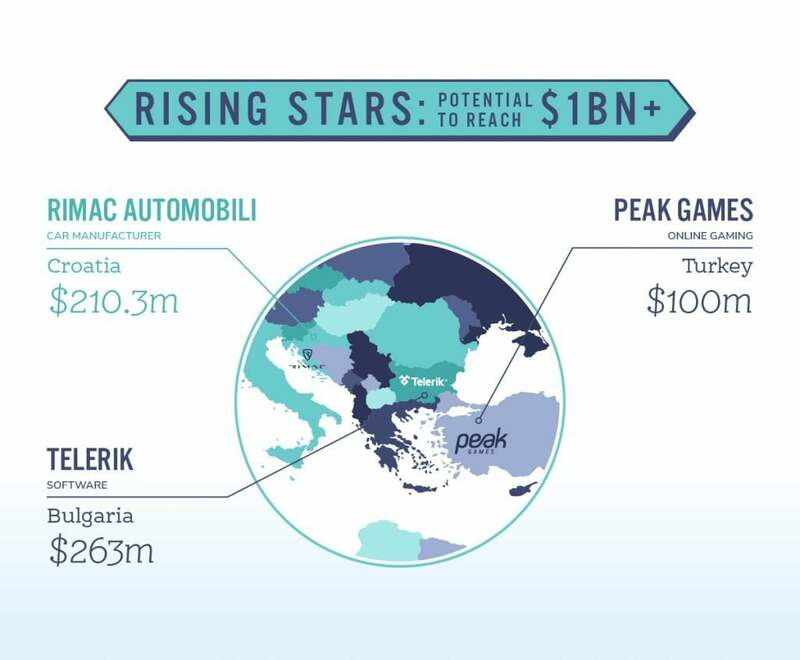 Electric car manufacturer, Rimac Automobili, was listed on this year’s Financial Times’ ‘1000 Europe’s Growing Fastest Companies’, and has signed deals to provide components for world-class car manufacturers including Aston Martin and Jaguar. The company managed to successfully gain investment from Porsche, when they took a 10 percent stake in June. To conclude, Europe still has a long way to go to become a fully-fledged tech juggernaut, but it’s made some tremendous strides in recent years. Although the number of start-ups year-on-year has remained relatively steady, the size of each company’s valuation is increasing. 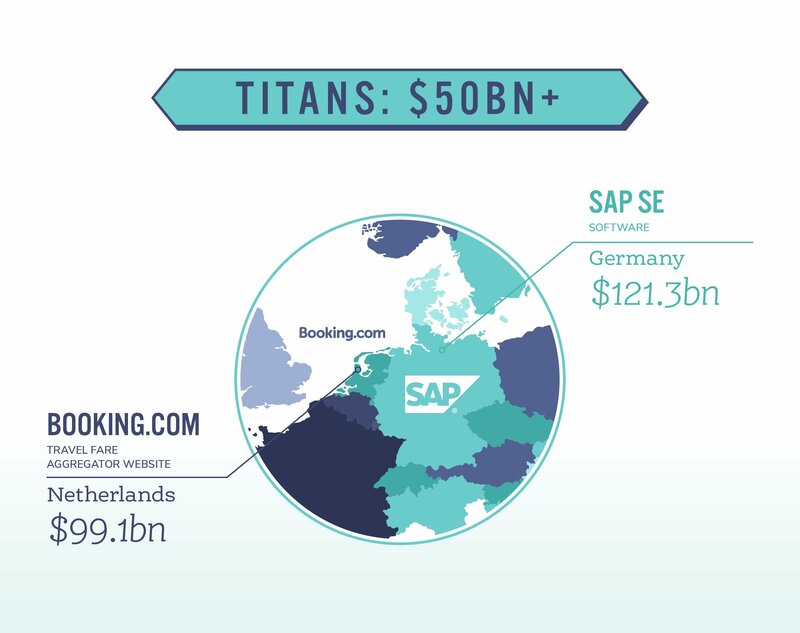 The UK may be hailed by many as Europe’s technology capital, but it’s not the only country driving success or producing billion-dollar companies, as shown by the likes of SAP and Booking.com. Europe’s potential to create tech titans is at an all-time high and it’s time to start rethinking the structure of our tech ecosystem to maximise these opportunities.